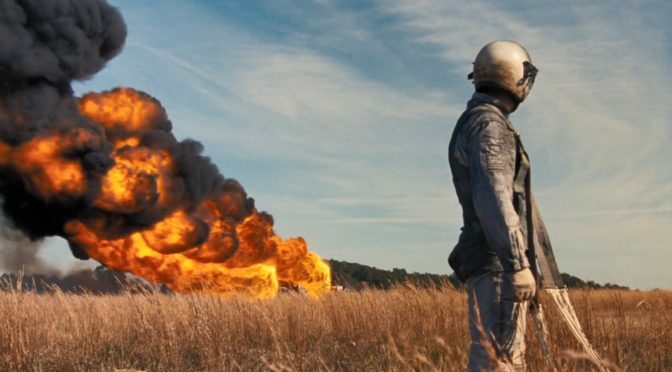 If 2018 was a crash course in how to make familiar stories feel dynamic and new, Damian Chazelle’s First Man may deserve credit for doing that in the most subtly inventive way. With a lot of the year’s great reboots and reimaginings, like A Star Is Born and Spider-Man: Into the Spider-Verse, the secret ingredient was a certain joie de vivre. Among the innovative things those films do formally, I think what sticks with me is that they move with passion and elated purpose. Joi de vivre and elation are the last words I would apply to First Man. First Man is different. In lending its voice to the chorus of astronaut films like Apollo 13 and The Right Stuff, it creates a more outwardly radical reimagining of the kind of film we expect it to be. It is not content to simply tell its type of narrative with more conviction and exuberance than its predecessors, for it is defiantly not an exuberant piece of work. Its way is less the enthusiastic embrace of tropes than the recontextualizing of trope through tone and through adding beats that are not often dwelled on in stories about space exploration. It is very much a kindred spirit to 2017’s Dunkirk. Both films are about Great Moments In History that are often thought of as unequivocal triumphs. Thousands are rescued from the beaches of France in the Miracle at Dunkirk. A rapt world huddles around televisions and radios as Neil Armstrong becomes the first man to walk on the moon. Both films build to those moments that most human beings think of, but they expand the narrative in unexpected ways. They ask us to consider what it was like to live in the moments before the Big Moment; before posterity, when triumph was still far from a certain thing. They ask us to view historical highlights in a fuller context and to reflect on the sacrifice and cost of those triumphs. If a film like A Star Is Born is about digging deeper into an old narrative well, First Man argues that the well of a story can also be widened. By considering more of the surrounding narrative. By including details that get left by the wayside in other tellings of the story, an old narrative can suddenly look radically different. Even the moments we already know about can take on new shapes as a result of new emotional context. Part of that new context is an astonishing level of technical detail. And to be clear, it’s not as if The Right Stuff and Apollo 13 lack for stunning technical crat. But it becomes clear in the very first shot that this will be a different kind of astronaut film. We open on Neil Armstrong hurtling toward the ceiling of Earth’s atmosphere, more than 100,000 feet above California’s Mojave Desert. In the prestige film version of this sequence, we would see Armstrong’s rugged profile, his powerful aircraft gleaming in the sunlight, and maybe even hear a rousing French horn or two. Instead, First Man’s opening moments have us utterly disoriented. The plane is completely cloaked in shadow and we can just make out that we are looking at one of its wings. Inside the cockpit, it’s dark as a tomb and we can barely see the outline of Armstrong’s stoic face. And forget symphonic fanfare. The only music to speak of is the deafening banshee wail of wind and the frenzied rattling of machine parts. It is 1961, more than eight years before the moon landing, and Neil Armstrong nearly kills himself horribly in a flight test, by bouncing off the atmosphere and into the void of space. It will not be the last time his profession tries to kill him. First Man follows the years leading up to the 1969 Apollo 11 moon landing and the various training programs and test missions NASA ran to prepare for that lofty goal. This included desert flight tests, a nearly fatal outer space docking mission, and the tragic cabin fire that claimed the lives of the first Apollo 11 crew. It is the story of the tribulation and loss of life that had to take place before a man could take that fabled giant leap into history. It is also about Neil Armstrong’s own personal tragedy. The Armstrongs lost their 2 year-old daughter to a malignant brain tumor in 1962, and that gutting loss casts its long shadow over the entire film, even as Neil Armstrong (Ryan Gosling, in a performance that makes deft use of his gift for playing taciturn figures) refuses to speak openly about it. It falls mostly to his wife, Janet Armstrong (Claire Foy, doing an exceptional job of shading and subverting the archetype of Great Man’s supportive wife) to keep the family happy and functional, and to be the one member of her family who can communicate openly and honestly with the other astronaut families in their planned neighborhood. Damian Chazelle wants us to see how the journey to the moon was not just a simple, uncomplicated bit of American heroism. He respects the story of Apollo 11 as a great human achievement, but he also wants us to consider how that triumphant arc was borne out of death and tinted by grief. The early complaints from detractors of the film took issue with it for being too cold and cerebral. I went in ready to wrestle with that criticism, but what I found was not the dry, clinical film I had expected. To be sure, an unmistakable chill runs through First Man, but that is not an accident or a failing. Chazelle and screenwriter Josh Singer (Spotlight, The Post) did not misread the recipe and forget to add two teaspoons of pathos. The viewer just needs to realize that First Man is about grappling with grief and death. It is about those things every bit as much as it is about Neil Armstrong or the 1960s or going to outer space. One of the ways in which First Man finds a new perspective on a very public event is by viewing it as Neil Armstrong’s own private ordeal. History may boil Apollo 11 down to the Moon landing and the “one small step” quote, but for Neil Armstrong, this was also the stretch of time when he lost a toddler to cancer, buried numerous friends, and was almost incinerated or sucked into outer space at least three times. There is a darkness in this story that has rarely been fully glimpsed. 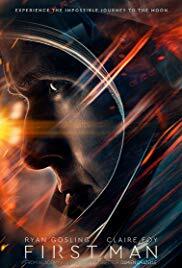 First Man finds more melancholy in the story of a successful mission than the estimable Apollo 13 found in the story of a failed mission. Even the horrifying Apollo 11 cabin fire, which was briefly shown in Apollo 13, feels much more upsetting here for how matter-of-factly it is presented. And, right wing pundits be damned, none of that sadness and subdued malaise is presented to nullify the genius, the daring, and the gobsmacking accomplishment of what Armstrong and his colleagues did. If anything, the full emotional wallop of Neil Armstrong finally making that first footprint in the soft lunar dust is amplified tenfold. Because we know how much heartache has gone into this project and we better understand the costly, arduous subtext. First Man is about a man who went to the Moon with a procession of ghosts in tow. Historical achievement is complicated. It is not just about the grand moments of success. Every victory like Apollo 11 probably has a ledger of setbacks, compromises and painful costs. Chazelle is keen on reminding us that these things are in the back pages of the true feel good stories we take for granted. First Man is also about grappling with a certain kind of stoic American masculinity. And this is not to be too reductive. Human beings are diverse and different men process emotion, and grief specifically, in different ways. But First Man is interested in a very classically masculine response to sorrow and trauma. And that response is essentially not much response at all; sitting quietly with your pain and trying to convince those around you that nothing is wrong. It is, to be clear, not one of the healthiest aspects of masculine behavior, and First Man is very critical of it up to a point. Janet Armstrong’s face tells us that she understands her husband’s almost pathological reticence, his stubborn unwillingness to talk openly about his bereavement or put any of his emotions on display. She knows this simple, quiet man and loves him. But she also knows full well the absurdity of his ridiculous reserve. And we sense that it has not been easy for her to lose a child, bury numerous friends, console their widows, and repeatedly almost lose her husband, only to have that same husband be defiantly unwilling to acknowledge that a damn thing is wrong. Chazelle punctures Neil Armstrong’s manly dispassion, but he is also curious about that kind of very male disposition. The impulse to bury what is painful or uncomfortable and just get on with it. With what? Something. First Man reframes the Apollo 11 story as a classic example of men coping with grief through action. Armstrong doesn’t want to talk publicly of his suffering (though we do see him wail like a baby when he feels sure that no one can see him). He just needs to get back to work; to wrangle his unimaginable anguish by way of toil and action. He needs a project, and that project just happens to be going to the Moon. A lot of painful stuff happened to Neil Armstrong in the 1960s on Earth. And, well, he just needed to get off the planet for a week or so. No big deal. I think First Man is also implicitly about how an entire country was going through a similar grieving process during that time. While NASA was planning Apollo 11, America lost Medger Evers and John F. Kennedy to sickening acts of murder. Kennedy had proposed the idea of going to the Moon when he was still alive. Suddenly, he was gone and America needed that silly dream goal more than ever. The 1960s were exciting but they were also excruciatingly sad. We lost more leaders along the way: Malcolm X, Bobby Kennedy, Martin Luther King, Jr. America was in pain, maybe too much to process all at once. Right or wrong, people felt the need to bury themselves in some bit of business. Whether it would make us whole again or not, we needed a project. We just needed to get a job done. We needed to get to the damned Moon. The beauty of First Man is that it honors the marvelous achievement of Apollo 11 while also deepening its place in American history. It posits that the Moon landing may well have been a Band-Aid for deeper national wounds. For all its technical merits, strong performances, and heady ideas, First Man is also just a tremendous sign of growth for Damian Chazelle. I refuse to use the words “return to form” here because I don’t think Chazelle has faltered yet in his young career. We can poke at La La Land all day long for being ideologically slight or for just being a very white and bourgeois piece of art, but it is still a fairly immaculate pop object. If that fizzy Technicolor jewel is to be Chazelle’s low, then his low is an exceedingly well-directed, sumptuously crafted thing of beauty. The work of a director with a ravishing sense of scope and a terrific eye for performances. Chazelle became history’s youngest Best Director winner with La La Land and almost took home Best Picture. He did not have to prove a solitary thing with his follow-up. He had every right to go make the safe, prestige-courting space biopic that First Man could have been. He could have made Apollo 13 with a stronger directorial stamp. He didn’t. He opted not to play it safe. On evidence of First Man, Oscar success has not boxed Chazelle into stiff notions of prestige filmmaking or made him compromise in the name of winning more trophies. Instead, he continues to be an ingeniously kinetic craftsman and a shrewd chronicler of art, success, perfection, and obsession. Success has not hobbled him because Chazelle is too canny about seeing what a conflicted thing success is. He seems to understand better than any director alive that perfection has its price and that there are no easy victories. And, by staying true to his own cerebral muse, he has turned what looked like an old fashioned, patriotic crowd-pleaser into one of the most moody, haunting films of the decade. Naturally, First Man was almost completely ignored at the Academy Awards. I like to think that Damian Chazelle is at peace with that. Like his driven characters, from Whiplash to First Man, I think Damian Chazelle knows the very specific kind of posterity he wants to chase.